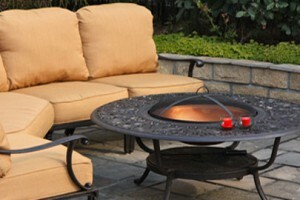 Most people assume that your patio is only used on the weekend and when you come home from a hard day at work. But what if we told you that you could use your patio to work, soaking up the sun while you do it? Working from home has become increasingly popular over the last few years, and we certainly have found that a few additions to your patio are going to make your outdoor living space even more suitable (and more comfortable) for working outdoors. One of the perks of having an outdoor office on your patio is the fact that you have natural lighting, which is great. However, you don’t want the sun in your face the entire time. Not only is the glare going to make it hard to focus on the screen, but it is also not going for your long-term health. To make sure that you are not exposed to too much radiation, a table with nestled umbrellas is going to provide coverage for your skin and eyes. Other alternatives to offer some shade include a patio cover or pergola. 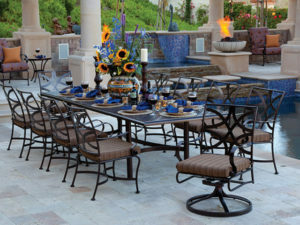 Most people only spend a few hours on their patio – so if you are going to spend countless hours on your patio while working, you want to make sure that you have everything set up perfectly. Make sure that you have a chair and table that are the right height (ergonomically speaking) but can also be adjusted later. This means that you are constantly comfortable and able to work in a variety of different positions. If there are weird hoops to have to jump through each time you want a slightly different look for your workspace, you are not going to be comfortable. The structure of the chair itself plays an important role if you want to make your outdoor space more ergonomic. As you might have seen already, an office chair does not really compare to a patio chair when it comes to ergonomics. However, as you are continuing to work, you can support your back by using a lumbar pillow. 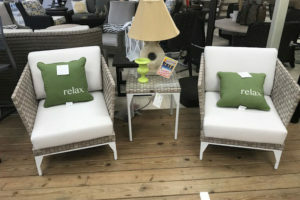 You also don’t have to compromise between comfort and style when it comes to your outdoor living space, because there are designer lumbar pillows available. Why should you spend your day trapped in an office indoors when you can just work from home? If you want to transform your patio into a comfortable outdoor office, we have everything that you need to make that a reality.